Best E-Book, The Magic Shop By Denise Little ElizaBeth Gilligan Bill McCay Laura Resnick Jody Lynn Nye Kristine Kathryn Rusch Josepha Sherman Mel Odom This is very good and becomes the main topic to read, the readers are very takjup and always take inspiration from the contents of the book The Magic Shop, essay by Denise Little ElizaBeth Gilligan Bill McCay Laura Resnick Jody Lynn Nye Kristine Kathryn Rusch Josepha Sherman Mel Odom. Is now on our website and you can download it by register	what are you waiting for? Please read and make a refission for you. All-original stories from P.N. Elrod, Jody Lynn Nye, Michelle West, and others explore the endlessly fascinating possibilities that would arise if a magic shop truly sold magic. An alright collection, seemed to be more flops then gems, but there are a few lovely stories in here though. A word of warning though, if you tend to read at work then I might suggest skip Michelle West's Dime Store Rings because coworkers might look at you funny for sobbing during your lunch break. 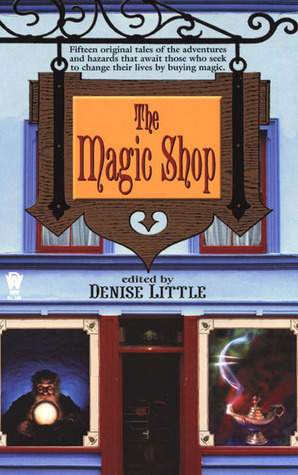 “Collection of shorts stories with a "magic shop" used as a central theme. Favorite's include: Every Little Thing She Does by Susan Sizemore. For Whom The Bell Toll by Jody Lynn Nye, Grails by Bradley H. Sinor and The Curse of the Itch by Bill McCoy. All in all entertaining if a bit too 'chick-littish". Would like to read more by Bradley H. Sinor.”Rob S wrote this review Monday, June 23, 2008. My current pocketbook paperback, a short story anthology chock full of treasures to be admired - just like the title setting. So far my most surprising gem found is India Edghill's beguiling take on the famous missing Russian princess. Haven't read anything by her before, but now I am sorting through anthologies for her other offerings. I read this book off and on for over a year. It took me so long to read because it was my car book for a long time. Plus, since it's an anthology, I could finish a story, even though I still had more to go.I liked most of the stories. Nice mix of stories, kept pace well, a good thing to pick up, put down and read here and there. Not a bad little collection, sort of hit-and-miss, like most anthologies. Keeps up a pretty good atmosphere. A book of short stories involving all sorts of magic.